Crude prices are at $51.93 this morning, down just slightly from yesterday’s close. Crude traded mostly flat yesterday, with prices ending the day just 25 cents below the opening. After Monday’s 3% gains, markets have been calm as some traders cash in their profits and exit the market. Still, the overall sentiment in the market appears to be bullish, and many traders are hoping prices rise higher. Refined products struggled yesterday, with mixed results. Diesel prices opened yesterday over $1.85 and dropped as low as $1.815 before rising again to close the day around $1.845. Prices this morning are $1.8467, near where prices closed yesterday. Diesel’s rebound yesterday came as the API reported a significant stock draw for diesel. Gasoline prices have plummeted over the past two days, falling from a peak of $1.7442 yesterday to just $1.6786 this morning. Prices are now back to where they began the week at $1.6700. Gasoline stocks suffered from a surprise stock build yesterday, which helped send prices plummeting despite crude’s maintained strength. The API released their stock data yesterday, which showed inventories beginning to return to more normal levels. Crude inventories fell by .76 million barrels (MMbbls), while gasoline built by 1.5 MMbbls. Diesel stocks, under pressure from strong fall demand, fell by 4.5 MMbbls, above market expectations. US Dollar has been rising significantly lately, finishing sharply up yesterday and continuing to surge higher. Yellen commented yesterday that the Fed is prepared to increase the federal funds rate at least once more this year, and potentially several times next year if the economy remains strong. The comments were not news to the market, but did serve as a reminder of upcoming dollar increases. 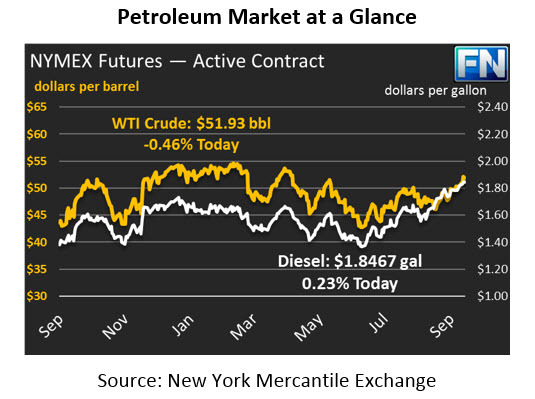 The rising dollar has created headwinds for oil prices, preventing a more rapid run-up for crude. Hurricane Maria continues affecting refineries in the Northeast. The storm has disrupted crude shipments from Europe, preventing resupply. At least one Philadelphia refinery has run out of crude from storage, while others are operating at reduced rates. This has helped boost refined products, especially diesel, over the past few days.